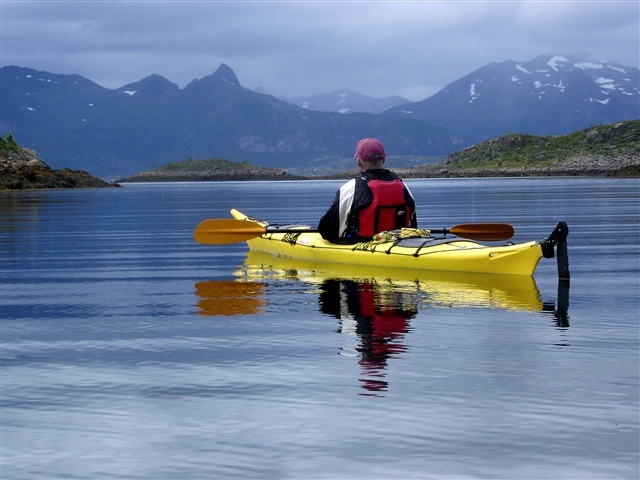 Husband of Magnetic North Travel founder, Andrew, travelled to the Lofoten Islands in July 2015 and enjoyed a sea-kayaking excursion on Trollfjord. Here he gives his feedback. “Off we go, or not. We don’t get far before our guide politely reminds me to put the dagger board (rudder) down. Whoops. I am not a pro-paddler more a dabbler but it is reassuring when my muscle memory kicks in. I remember the feeling of sea kayaks that can be a bit twitchy. It makes you focus on your paddling stroke, feet (pedals to steer) and your knees (bracing the sides). I’m at the back of a two person sea kayak heading out across a channel that cuts between two of the Lofoten Islands in Norway’s Arctic Circle. 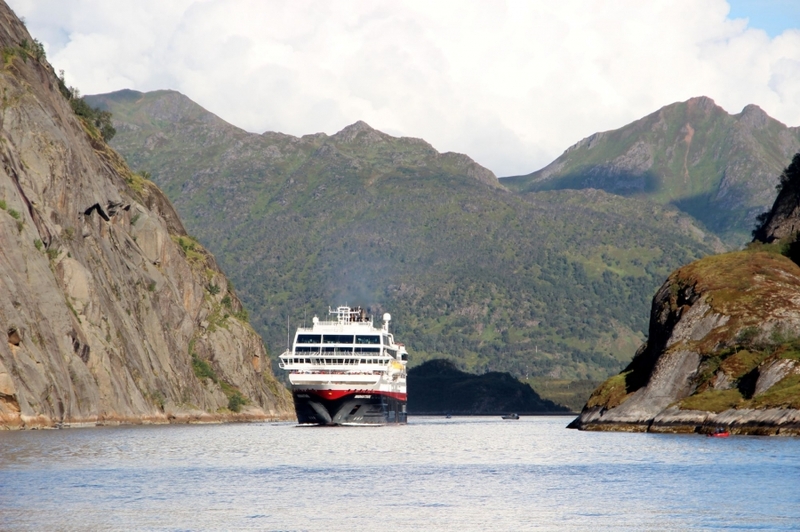 With my co-paddler, who I’ve just met, we sync strokes and set a respectable pace across the channel towards Trollfjord one of the most spectacular sites on the Lofoten Islands regularly visited by Hurtigruten. We cross the channel that is a bit ‘rough’ (note: my definition for anything other than a millpond). There is some wind (more a breeze) that is creating white caps. 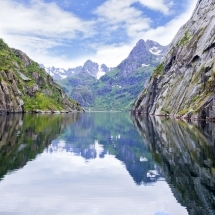 Once over we paddle slowly into Trollfjord and spend a couple of hours paddling around the calm and sheltered crystal clear fjord. 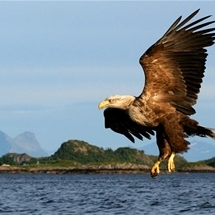 Overhead a sea eagle launches in search of its lunch; we enter a waterfall; gaze up at the sheer glacial-formed sides and learn why the rock cliffs are different colours (clue: it involves the sun). Jellyfish silently pass under our kayak and we disembark on a rock for lunch. I get a glimpse into the local maritime folklore and the exploits of famous ship captains. 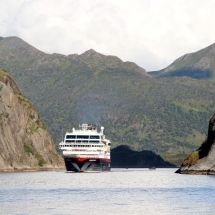 Lofoten has some unique sea currents which makes it a challenging place to sail. Interesting nautical techniques have developed such as dropping anchor and performing a sort of hand-brake turn into port. Luckily no such maneuvers were required as we paddled safely away from Trollfjord past the island of Ulvoya before heading back to the launch. 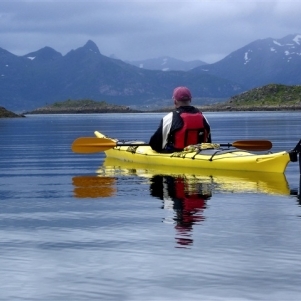 You can travel with Magnetic North Travel to the Lofoten Islands in summer and winter and join a sea-kayaking tour. 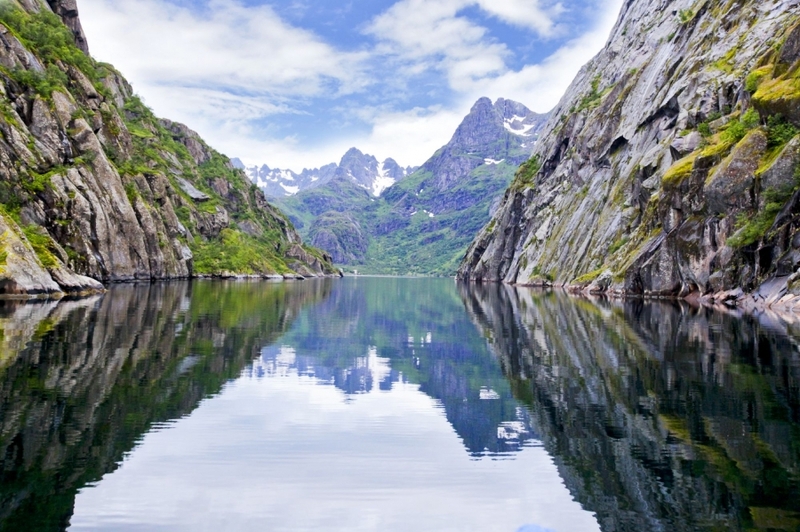 In winter the location may vary due to weather and sea conditions, but many of our clients are not put off by the Arctic climate and enjoy a memorable time paddling the fjords.